Tour Includes: Cost of wine tasting, private transportation, service of driving guide, tolls, parking, taxes. Departure Points: Umbria. Also available from Rome and Florence, tour duration will be 10 hours. This fabulous day trip will take you into the Umbrian countryside for a guided tour of Spoleto and Montefalco. 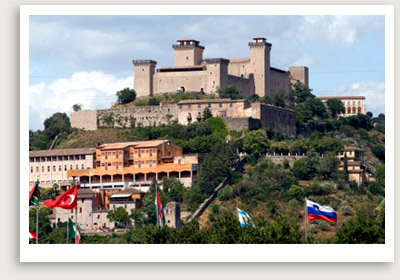 Your first stop will be ancient Spoleto, a beautiful Roman town built atop a mountain on the Flaminia Road. Spoleto boasts many important Roman structures including its stone wall, theater and bridge, the town is also known for its 14th century fortress. You will explore this charming city and its great churches, museums and medieval piazzas, have lunch, before heading to Montefalco for a brief visit. Montefalco is also known for its fine wines, sponsoring an annual “Wine Week” every Easter. The town’s most renowned grape, Sagrantino, produces a wonderful red wine. You will visit a wine producer and have the opportunity to taste some of their vintages. Time permitting, you can also tour one of Montefalco’s beautiful churches, which cover the Romanesque, Gothic and Renaissance styles. The beautifully frescoed church of San Francesco has been converted to the town’s museum, offering an extensive collection of art and artifacts from Umbria.